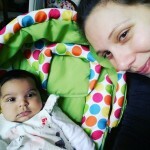 Insights from a new Mom; what she believed would happen when her daughter entered into this world and what has really happened so far. When I was pregnant somebody gave me a stone. Agate. This person told me that this would help me bond with my yet to born daughter. I took the stone in my hand, and put it in my coat pocket. 3 days ago, I remembered about this stone. I searched through the chaos that currently is my wardrobe, put my hand in to the pocket of the coat that I remembered wearing that day, and there it was. Shiny, cold and beautiful. 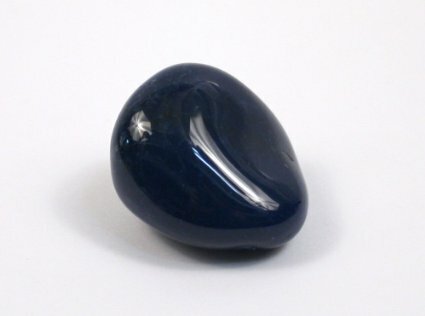 The stone I was given. I took the stone in my hand and looked at it. I immediately took it to my daughter’s room and placed it on her window sill. As I write I look at it (and her), and wonder what I should do with it, if anything. So this is where the next chapter begins. With Livia’s stone. My daughter is now 15 weeks old. I also feel that I am only 15 weeks old. I say this because most of what I knew before she came along now feels irrelevant and I am left only with what I have learned since her birth. Everything looks different to me now, smells different, tastes different. The world is an exciting new haze of ‘different’. Again, she has taught me so much more in her 15 weeks than I was able to teach myself in 37 years. She has taught me that I can do anything, and that no one has the right to tell me otherwise. My writing for me is a way to understand this change. I would never aim to generalise or suggest that anyone experiences motherhood in the same way as I do. My daughter currently sleeps happily on her father’s lap. Its a chance for me to write. A rare chance. There are so many things I enjoy about motherhood. One of my favourite things so far is the way in which my daughter smiles at me when she sees me first thing in the morning. It makes the interrupted sleep that I often have at night totally worthwhile. Her smile is my sunshine in the morning. It is the reason I get up, out of bed. I look at children playing in the park and can’t wait for her to be that big. Climbing and swinging in the afternoons. I also know that I should cherish these early days as they go so quickly. Motherhood is a strange combination of struggle and joy. Rather like climbing mount Everest or completing a degree and turning up at your graduation ceremony. The joy outweighs the struggle. But the struggle outweighs the joy too, at times. It sits on her window sill. I’m not sure whether to carry it with me or not. My heart swells when I’m around her. What difference would a stone make? It sits glistening, dark grey with layers of decades, centuries of heat and pressure moulded in to what is a beautiful piece of nature. Nature. Isn’t this all nature? Or natural. My days pass quickly and are a mixture of chaos and calm. But never boring. My daughter shows me something new each day. Each night, we sleep together. Dreaming of what is to be. What has been. And we will only ever dream of being. My love for her grows each day. My admiration for her strength and resilience grows. I don’t worry about my daughter. She will be fine. In fact, she makes me fine. A better person. Maybe its the stone. Will I ever know. But one day I”ll give it to her. In her hand….so she can cherish the memories that this stone will no doubt hold. I embark on this next chapter with trepidation. I will soon return to work. I will need to leave my precious daughter with someone to care for her, like I do. Every day. How will I do this? I have no idea. I should have been prepared for this, but how can you be? How can you ever prepare for motherhood.